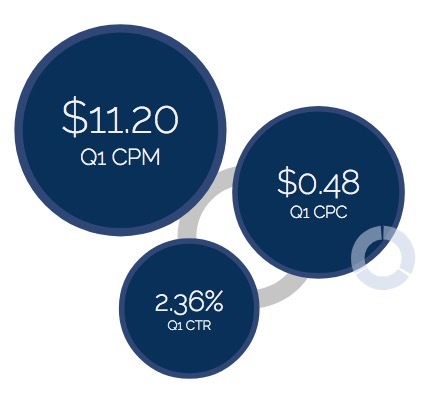 Be sure to read the Q1 2018 PPC Benchmark Report for the latest ad performance trends. Based on AdStage data, Facebook ad CPMs increased significantly from Q1 2017, increasing sharply in Q2 2017, and again in Q4. Our data shows Q1 2018 CPMs declining 12.5% compared to Q4 2017. 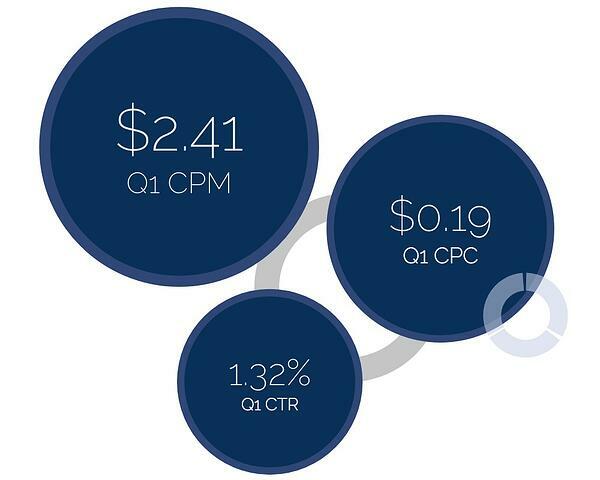 CPCs on News Feed and right-hand column ads continued to increase throughout 2017, only to slightly decline 12.7% in Q1 2018, ending the quarter at a median CPC of $0.48. Increased competition and better engagement both contribute to higher prices, but the placement remains one of the best for return on your ad spend. Our data shows that median CTRs on Facebook News Feed and right-hand column ads only changed by -0.8% Y/Y. Quarter-over-quarter changes to CTR are in the hundredths of percents, confirming CTRs have been both stable and predictable through the last two quarters. Our data shows that median CPMs have declined for the second quarter in a row, down 36.7% Q/Q, ending Q1 at $2.41 for marketers on the AdStage platform. At 29% down Y/Y, we are unsure if this new low is the beginning of a trend, or a temporary correction. Either way, marketers benefit from lower costs across the Audience Network. Median CPCs decreased for the second quarter in a row, dropping 27% Q/Q from Q4 2017, ending the quarter at $0.19. The last five quarters of median CPCs draw a different curve, one that may show hidden seasonality. We’ll have to get our data team to dig deeper to uncover further insights for our next report. Our data show that median CTRs on the Facebook Audience network remain fairly even between Q4 2017 and Q1 2018, decreasing from 1.38% to 1.32%. Median spend on the Audience Network increased 22% between January and March 2018 among marketers on the AdStage platform. Yet, that additional spend was necessary to retain the level of clicks, and did not appear to increase engagement. The data from marketers using the AdStage Platform only represent a fraction of the overall industry. While you may experience similar performance metrics as our data show, it’s important to understand the overall trends and changes that can affect your unique campaigns. Marketers are doubling down on Facebook advertising this year. With GDPR and other data privacy changes being implemented in Q2, marketers are keen on learning how to play (and pay) to win in this new landscape. Facebook continues to develop and release new ad products to compete with other networks, and more so with ad fatigue within their own properties. Instagram Stories now supports Carousel Ads, allowing marketers to include up to three photos or videos, expanding the ability to tell engaging stories. As Stories becomes a full-fledged product within a product, we’ll continue to see advances in what Instagram can provide marketers. Facebook has also introduced new dynamic ads for lead generation, allowing leads to provide contact information for specific products or services displayed in the dynamic ad. Facebook made huge improvements to their split testing capabilities, allowing marketers to test ads against each other on many different objectives. In our experience, testing is key to increased engagement and should be an integral part of your marketing strategy. Analytics has also benefited from a refresh with the addition of many new features. It’s not only important to constantly test new strategies; you need to understand the down-funnel effects and ROAS to make informed decisions. With continued competition for inventory and increasing prices, new Analytics features will help uncover winning creatives much faster. Download our Q1 2018 PPC Benchmark Report for additional performance data on Instagram, Messenger, and other Social and Search ads.